Are you looking for innovative ways to improve your search engine rankings? In an earlier post I talked about the need to fully optimize your website and blog posts for search engines. However, content optimization will only take you so far. For a website to really take off in the search engine rankings, it needs to generate incoming links from relevant and reputable websites. And you have little control of incoming links. All search engine optimization (SEO) starts with content. The first step to generating incoming links is to create content that others will want to share. Blog posts that solve problems, provide a valuable resource, entertain, demonstrate innovation or even create controversy can all generate incoming links. Average content won’t cut it. It needs to be outstanding. Facebook, Twitter, Digg and other social media sites are driven by the desire to share. One of the quickest ways to build social media credibility is to share outstanding blog posts, videos or other online content. When you create content that will give Twitter users or bloggers credibility just by sharing it, you’re going to generate valuable incoming links. Don’t forget to make your content easy to share by including TweetMeme, Digg, Facebook or other buttons that are easy to find and use. Press releases are a great way to generate incoming links. A good press release can be directly published by any of a number of highly trafficked news organizations. Again, the key is to provide content that is of value to others. When writing a press release, think like a reporter. What “news” is important to the reporter’s readers? Write it as if you were the reporter writing a story. Make the reporter’s or editor’s job easy and your press release has a much better chance of getting published. One of the big advantages of online press releases is that you can control the back links to your site. Linking keywords in your press release to relevant pages on your website or blog can result in valuable incoming links. Even the link coming from the press release site can be beneficial as most PR distribution sites have a high Google page rank. The key is to link from the body text of the press release to pages deep within your site such as a related blog post (deep linking). For example, a link to an article on your website providing tips for writing press releases wrapped around appropriate keywords (as opposed to a link to your home page) is a deep link. 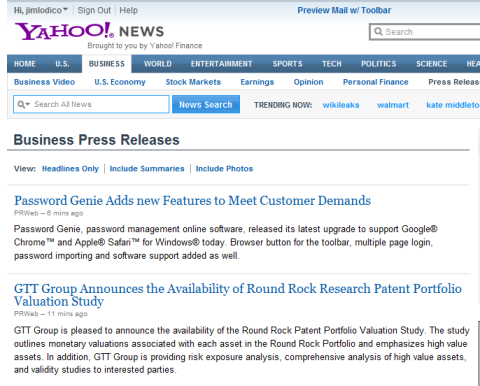 Although there are a number of free press release sites available, paid distribution sites such as PRNewswire.com are often monitored by reporters and feed directly to Yahoo! News and other large websites. If you have the resources, a good press release on a premium distribution site can quickly pay for itself. Distribution sites such as PR Newswire, Business Wire, PrimeZone or Market Wire distribute press releases to Yahoo! News and others. Writing guest posts (like I’m doing here) on highly ranked, highly trafficked websites can also generate powerful incoming links. Writers often will offer to write free posts in exchange for a link back to their own website. If the publisher will allow it, a link or two in the body of the post anchored to related keywords (deep links) can be even more valuable than the link in an author bio. Don’t believe me? How many of you clicked on the “tips for writing press releases” link above? If you’re a good writer and have something to say, landing a guest spot isn’t all that difficult. The key thing is to pitch the website owner (or appropriate editor) an article that will be of value to his or her readers. Pitch the idea, not the entire article. Prior relationships don’t hurt either. If there’s a blog you’d like to write for, constructive comments and active participation can go a long way. Remember, many blogs are run by individuals or small operations and creating daily content can be a lot of work. A good blog post by a guest writer can be beneficial to both the blog and the writer. Don’t be afraid to link to other blogs or publications. Linking to content of value not only provides a service for your readers but the incoming link will show up in the other blog’s analytics. Many blogs even display incoming links along with the comments. These links are one way to direct other bloggers back to your site. If they see something they like, they might return the favor. Google also likes to see outgoing links to relevant and reputable websites. Look for websites and blogs that offer content that’s complimentary to yours and let them know you’re there. For example, a lawyer who specializes in waterfront issues and riparian rights might share an article with a realtor who specializes in waterfront homes. This can be as simple as an email letting the blogger know you enjoy his blog and a link to an article of interest to his readers. If you can directly tie it into something the blogger is currently writing about, even better. In the old days, it used to be common to ask for a link exchange. Now, these link exchanges can come across as spammy—especially to the owner of a website with a high Google ranking. You’ll get much further with content that is highly relevant to the blogger. This is a tip that can do wonders for a group of topically related bloggers. About five years ago, I started blogging about my favorite college football team (and my alma mater). At some point, a number of bloggers in the Big Ten began to organize behind the scenes. The most recent headlines from associated blogs can drive traffic for everyone in the group. We all agreed to include links to each other’s blogs on our websites and someone created a feed reader that published the most recent headlines from the group in our sidebar. At the time it seemed like a good way to pick up a couple of readers from other college sports blogs. I had no idea the impact from the incoming links would be so huge. Over the years, many of these blogs have grown into highly ranked websites while others have merged with larger content providers. Thanks to the network, we all have a number of incoming links from highly ranked websites loaded with relevant content. The feed reader in the sidebar also notifies fellow bloggers and their readers of my most recent posts. I’ll often write headlines aimed at other blogs in the feed knowing that it may generate a response or at least drive traffic from other sites. This technique can often trigger a response from other blogs generating even more traffic for both of us. Transfer this technique to a business blog and you could create a very powerful network. If you’re worried about competition, look for bloggers outside of your geographic region or closely related but not in direct competition with your business. Realize though that the benefits of the incoming link juice far outweigh the concerns of a few readers visiting another blog. Besides, if your content is good enough, they’ll find their way back to your site. If you have a blog post that has achieved a good Google page rank on its own, use it to build in a couple of links to other pages within your site. The link will still hold search engine value even though it’s coming from within the same site. Link-building takes time and should be an ongoing process. It’s also a world in which the rich get richer. As a website moves to the top of the search returns, lazy researcher syndrome kicks in. Reporters and bloggers will often click on the top returns just because they’re the first to pop up on the page. The upper positions on the search returns also bring perceived credibility just because of their position. As you work your way to the top positions, incoming links will start to develop on their own. Have you found success generating incoming links to your website or blog? What methods have you tried and what worked for you? Leave your comments and suggestions in the box below. Jim Lodico is a copywriter and marketing consultant specializing in creating powerful content and teaching businesses how to use blogs. You can follow him on Twitter @jlcommunication.